I’m in Chicago, not for the deep dish pizza but to see how fast the first 5G network in the U.S. operates on a smartphone. The verdict? Pretty damn fast. I hit more than 600 megabits per second at one point. And yes, the pizza is pretty good too. Verizon jumped the gun and unleashed its 5G network on April 3, a full week earlier than its original April 11 launch date. That’s presumably to time it with the three South Korean carriers that were also kicking off their respective 5G services — all for the chance to claim it was the first to release a commercial 5G network in the world. (It did). But Verizon’s new network is nothing like you’d expect. Why is Verizon’s 5G network only available in a handful of touristy spots in Chicago? We have known this would be the case for a while, because carriers have said 5G will slowly roll out in small areas for select cities, and will then gradually expand over the next few years. Sprint, for example, plans to kick off its 5G network in May also in Chicago, but it will only be available for some 20 square miles (the city of Chicago is about 234 square miles, as reference). The reason why has to do with 5G technology. 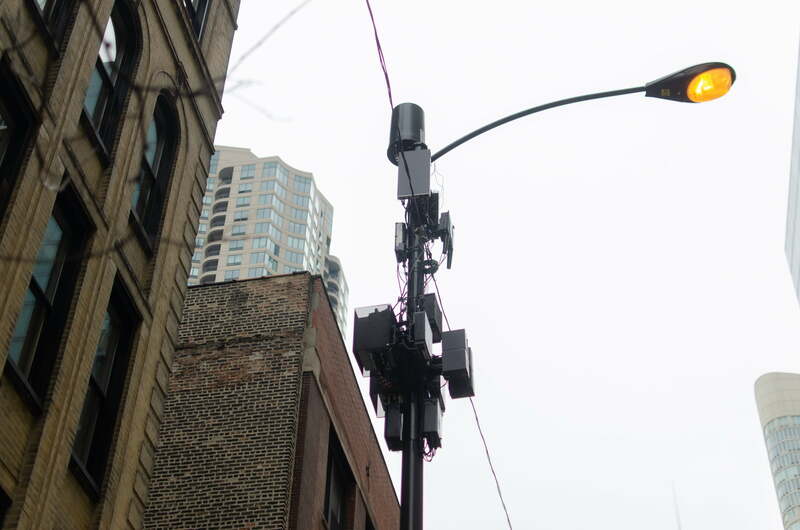 Verizon is using millimeter waves (mmWave) to deliver super-fast speeds from base stations set up around Chicago, which are also called “5G nodes.” The downsides of mmWave technology are that it can easily be blocked (by walls, cars, etc), and that it has a very, very short range. Go a block past one of these nodes and it’s likely you’ll be back on 4G LTE. It’s why T-Mobile and Sprint are approaching 5G differently, with low-band spectrum, which can penetrate objects and can cover a much larger area. It’s not perfect, though, as it doesn’t offer as fast speeds as mmWave. With Verizon’s approach, you can see the challenge of rolling out 5G coverage across the country, as it requires deploying a large number of these nodes. So it’s starting small with these areas in Chicago and Minneapolis, but the carrier has plans to expand its 5G network to 30 cities by the end of the year. Finding a 5G node is one thing — you need a 5G smartphone to connect to these networks (yes, you’ll have to upgrade). 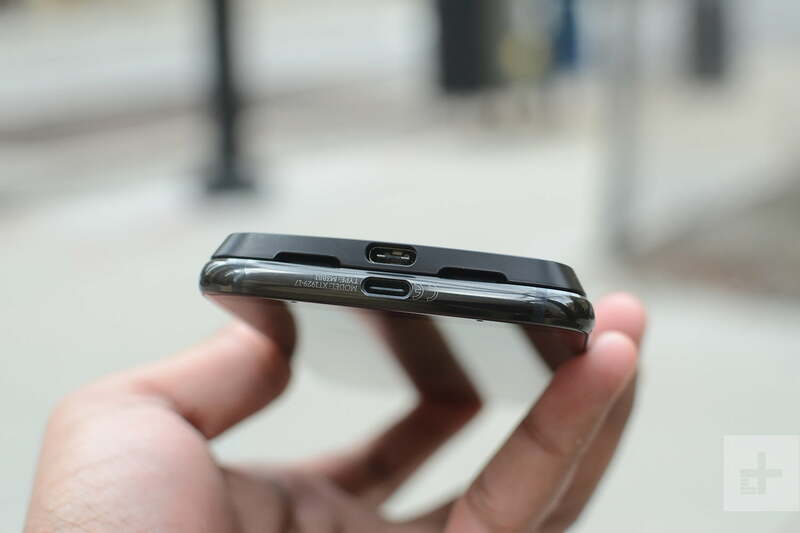 The only option at the moment is Motorola’s Moto Z3, a mid-range Android smartphone that launched last summer, paired with a separate 5G Moto Mod that magnetically snaps to the back of the phone. 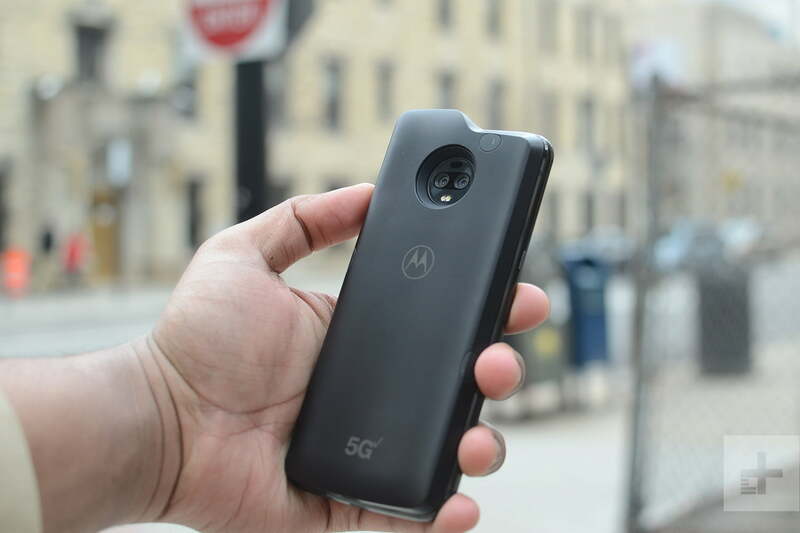 The Moto Z3 alone can’t connect to 5G networks, which is why you need the mod, which has four mmWave antennas and a built-in 2,000mAh battery for when it’s switching between 4G and 5G. Finding a 5G node is one thing — you need a 5G smartphone to connect to these networks (yes, you’ll have to upgrade). The Moto Z3 can be bought for around $480 (it’s exclusive to Verizon’s network), and the mod costs an extra $200 — that’s a promotional price for a limited time as it actually costs $350. And that’s not all: Postpaid Verizon subscribers will have to shell out an extra $10 on top of their unlimited plan to access 5G wherever it’s available (the first three months are free). That brings the total cost to around $700 (barring your cellphone bill), which is a surprisingly affordable way to access 5G now. At least, compared to the handful of 5G smartphones launching soon, like the Samsung Galaxy S10 5G or the LG ThinQ V50, where the price tags will undoubtedly exceed $1,000. But that means using a mid-range Android smartphone if, for some reason, you want to desperately connect to Verizon’s current 5G network. 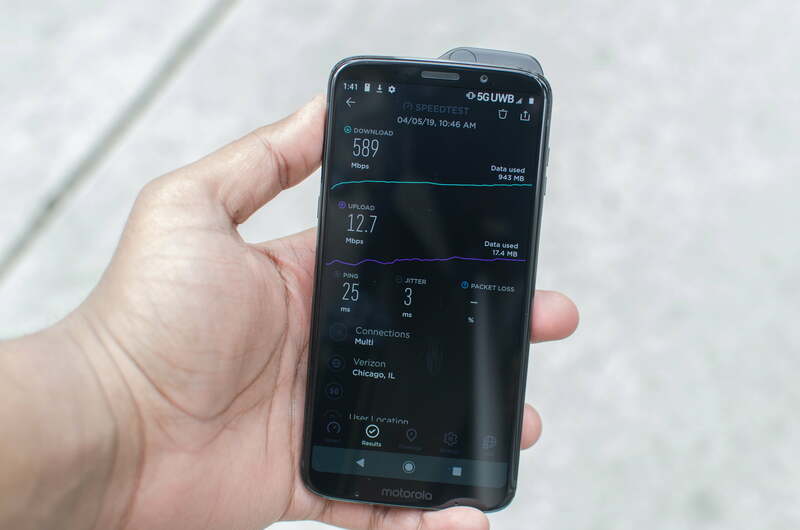 On top of this, the Moto Z3 paired with the 5G Moto Mod turns into a chunky phone that’s far from the futuristic device you may have thought you’d be using to connect to the long-awaited 5G network. The other 5G Android phones coming out soon do have the benefit of being slim and looking more similar to modern smartphones, but they will eat a serious chunk out of your wallet. If you’re on an iPhone, you’re out of luck as the company isn’t expected to launch a 5G-ready phone until 2020. Yup, that’s 624Mbps. That’s the fastest download speed I got using Ookla’s Speedtest app on the Moto Z3 with the 5G Mod. If that means nothing to you, average 4G LTE speeds on various carriers in the U.S. sit somewhere between 15 and 50Mbps, with around 60 milliseconds or more of latency (the delay between the transfer of data). I hit 29 milliseconds. That’s impressive. I also had another Moto Z3 that didn’t have a 5G Moto Mod, on the same Verizon network, and it hit 230Mbps download and 7.12Mbps upload speeds. That’s still pretty fast by average standards, but the 5G mod does make a stunning jump ahead. What does this mean in terms of day-to-day use? Downloading songs and movies theoretically should take mere seconds, if it took minutes before. Don’t expect upload speeds to change much at the moment — Verizon said it’s currently using 4G LTE for uploads, so you won’t see much of a difference there. Verizon claims its current 5G network in Chicago and Minneapolis will deliver typical download speeds of 450Mbps, with the potential to hit nearly 1Gbps as well as less than 30 milliseconds of latency. That’s about on par with what I’ve seen so far walking around the city near these nodes. But until now, we’ve been hearing 5G will bring speeds ranging from 1 to 10Gbps, and between 1 to 10 milliseconds of latency, so what we’re seeing at the moment is on the low end of the spectrum. 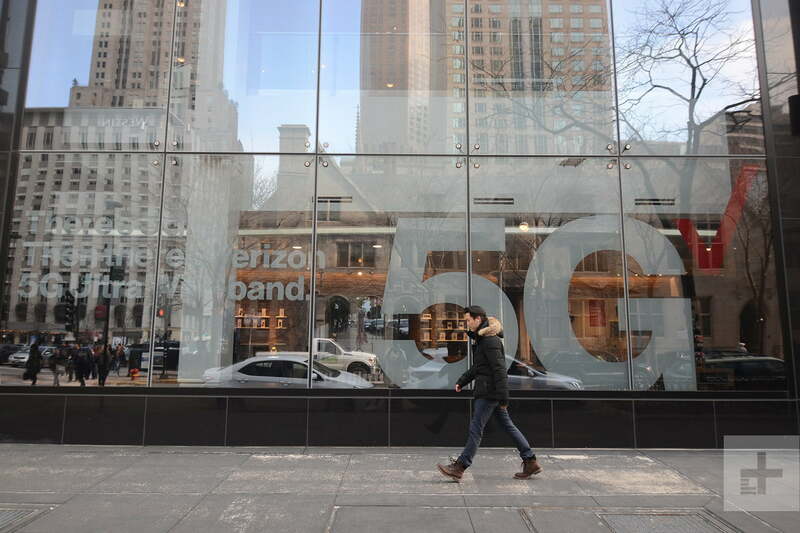 But it’s early days, and Verizon said it will be delivering “regular improvement in 5G Ultra Wideband speed, latency, and overall network performance,” so you should see faster results by the end of the year. The phones I was using weren’t fully set up with all my usual apps, so I couldn’t get a definitive picture of how a 5G connection could change my personal smartphone usage. It’s not going to make your apps run faster or anything like that; Instagram and Twitter may load content faster, but I’m not sure it will be enough to notice a difference since it’s quick already if you have good 4G LTE coverage. I did try to download a Netflix show, and it didn’t go as well as I thought it would. It was an episode of Black Mirror, and the Moto Z3 with the 5G Mod downloaded 14 percent (25MB of 168MB) of the show in two minutes. That’s far from fast. Meanwhile, the Moto Z3 without the mod downloaded 33 percent (57MB of 168MB) of the same episode in the same timeframe. Color me confused. I asked Verizon, and it said the reason is likely that the host server where I’m downloading the show from isn’t optimized for a 5G connection — so companies like Netflix will have to make some changes to optimize the experience. It’s a disappointing answer to hear, because you kind of want it to just work, but like the 5G rollout, adapting to 5G will take time itself as well. When you’re not connected to 5G, the Moto Mod should deliver slightly faster data speeds when connected to 4G LTE than without it. I did a test on the Moto Z3 without the mod and the one with it (not simultaneously, as that can affect the other device’s speed) on 4G LTE, and the former gave me.16.9Mbps download and 14.7Mbps upload speeds with 22 millisecond latency. The phone with the 5G Moto Mod delivered 70.9Mbps download and 9.15 upload with 25 millisecond latency. So for the Moto Z3 at least, there’s a good reason you may want to keep the mod on when you’re out and about. 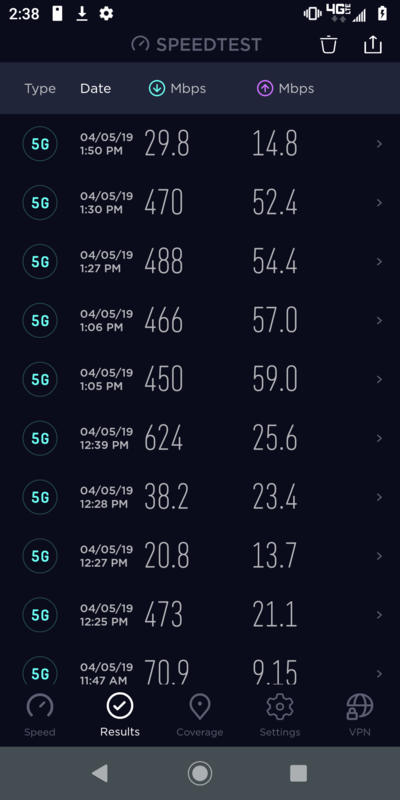 I fired up the Samsung Galaxy S10 Plus and put in the same Verizon SIM card, just to see what the latest flagship can hit on 4G LTE. The results were: 86.6Mbps download and 18.8 upload, with 33 milliseconds of latency. That’s better than the 5G Moto Mod on 4G LTE, so it’s heavily dependent on the modem your phone has inside as well as the network you’re on. The iPhone XS Max on AT&T’s 5G E network, for example, only hit 26.3Mbps download and 11.3 upload with 22 millisecond latency in the same area. While I was excited by the fast download speeds, there are a lot of caveats. I walked to five different 5G nodes around the inner city of Chicago, which are all situated near popular landmarks like Magnificent Mile. The description in Verizon’s press release of these 5G locations were vague — I’d have wasted a lot of time looking for them if I wasn’t given more precise intersections. I often needed line of sight to the node for the phone to connect. Even then, I still had to walk back and forth a few blocks to find the node. It’s not like I automatically connected to 5G when I was in the area — I often needed line of sight to the node for the phone to connect. One thing that’s important to note is that walking around looking at the status bar is apparently a poor way to look for a 5G connection. The 5G Ultra Wideband symbol will only pop up when there’s a request for data — so when you’re using an app like Netflix or scrolling through Twitter. It’s why several journalists mentioned the symbol just swapping between 5G Ultra Wideband and 4G LTE. It’s not that the 5G connection is spotty, it’s just that the phone is likely not making any (or very little) data requests. I saw the same issue happening, but as soon as I fired an app that required data, the 5G Ultra Wideband logo lingered on my status bar. This is still incredibly confusing for consumers who may see their phone just constantly swapping logos between 4G LTE and 5G. Verizon said it’s listening to feedback, so we may see a better way to understand when you’re connected to 5G on the phone at some point. But the other big issue is coverage — not in the sense of how few 5G nodes are set up (that will expand over time) — but how far away from the 5G node you need to be in order to stay connected. I walked a full block away from a node, and I was no longer able to connect to it. Here’s the speed test result from that distance: 20.8Mbps download and 13.7Mbps upload. That’s average 4G LTE speeds. At another node, I was half a block away from it and ran a speed test while it was in my line of sight. My results were 470Mbps download and 52.4Mbps upload. That’s great! Well, I walked two steps into an alley and did the test again — 29.8Mbps download and 14.8Mbps upload. It’s the downside of mmWave, but it’s still startling to see how poor penetration really is through walls. I walked into a cafe near another node, and the Moto Z3 wouldn’t connect to 5G. So far, Verizon’s 5G will work well outdoors within 800 feet or so of these nodes — not so much indoors or any further. And finally, the other big concern is battery life. 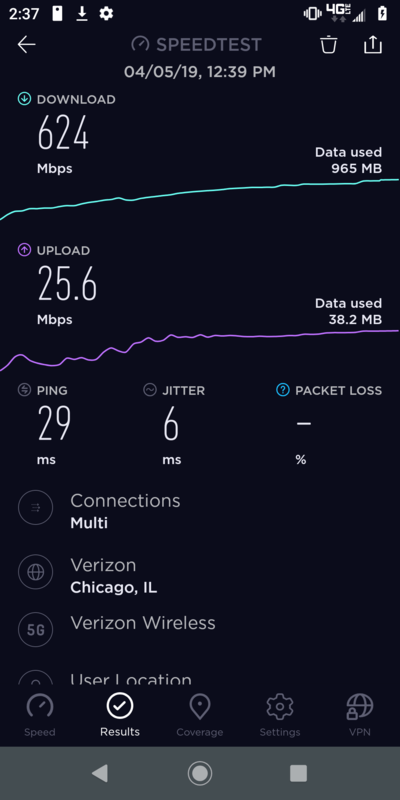 I spent around two and a half hours walking around the inner city of Chicago node to node, largely only running speed tests with the Ookla app on the Moto Z3 with the 5G Mod. The phone itself didn’t lose that much juice — it had 80 percent left — but the Moto Mod had just 35 percent remaining. I can’t imagine what it’d be like if I was actually using the 5G connection to download content. Battery drain is definitely a worry, and it’ll be interesting to see how phones like the Galaxy S10 5G deal with it. Samsung put a massive 4,500mAh battery in that phone, and it seems like this may be why. Do you need 5G now? I don’t see why anyone should buy a Moto Z3 or the Moto Mod right now — even if you call yourself an early adopter and are based in Chicago or Minneapolis. The 5G nodes are just far too sparse, and it doesn’t even ensure a strong connection just 1,000 feet away. At $700, it’s still quite a large investment, and Verizon’s network is not there just yet. So does that mean you should buy a 5G phone at all in 2019? Likely not. The Samsung Galaxy S10 Plus costs $1,000 and it can’t connect to 5G — the Galaxy S10 5G can, and it will likely cost a little more. The same rings true for the LG V50 ThinQ. This year, 5G phones will be expensive, so it’s likely not worth shelling out when the networks are so sparse and limited to select cities. It’s likely we’ll see prices drop significantly by 2020 or 2021, which will be a better time to upgrade, as carriers will have made significant improvements to coverage across the country. All of this is very similar to the early days of 4G, where the connection wasn’t available everywhere, and battery drain was a huge problem as phones tried searched for the right network. There will be kinks now with 5G’s early days, and you’ll just have to wait until the carriers smoothen them out over the next few years. Until then, you’ll be continuing to use 4G LTE all the same. The beauty of 5G doesn’t just revolve around faster internet speeds on your phone. The lower latency means doctors can perform robot surgeries from remote locations; or playing with a friend in 4K through virtual reality will be seamless and lag-free. It opens the path toward smarter cities, smarter self-driving cars, and more. It really will be game-changing — but from what I’ve seen here in Chicago, it’s clear we have a long way to go before 5G becomes anywhere near as revolutionary as promised.